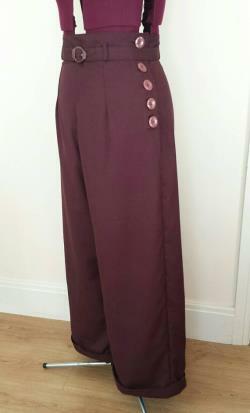 1940s style high-waisted slacks with turn ups and belt, made from an original pattern in modern burgundy coloured gabardine. 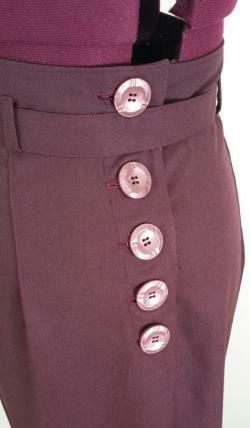 They feature a side button closure using original 1940s pearlescent burgundy celluloid buttons. The belt features an original 1940s burgundy buckle. 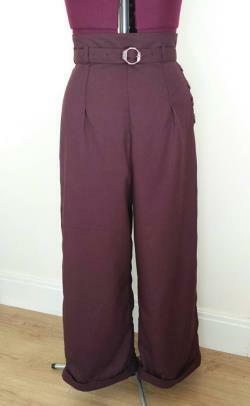 Detail is accentuated with burgundy top stitching. 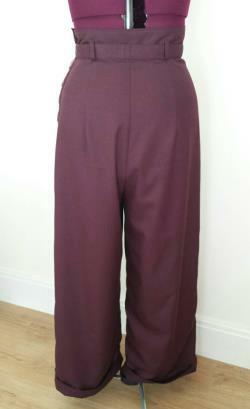 The slacks are near to a uk size 14. Outer leg length is 41 measured from waistline to floor. All my garments are handmade by me from original vintage patterns and made to the recommended specifications on the patterns. I try to use vintage fabrics, trimmings and notions but this is not always possible. Where vintage is not used, it will be included in the description. Please note this is a one off item. Suitable for handwash/ 30 degree wash only. Please remove belt before washing.